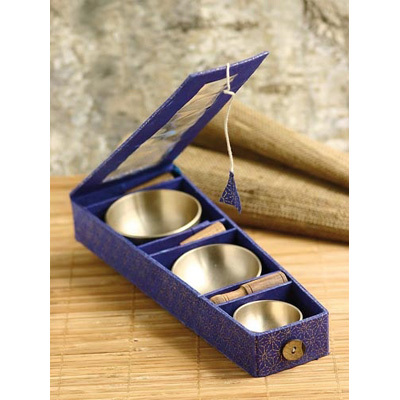 3 small Tibetan singing bowls in a blue gift box, complete with 3 small wooden sticks and 3 small pads. Ø small singing bowl ca. 5 cm, ca. 60 g.
Ø middle singing bowl ca. 6.5 cm, ca. 100 g.
Ø large singing bowl ca. 7.5 cm, ca. 160 g.